social media – Creative Solutions & Innovations, Inc. I just love when the universe hears me. I’ve been thinking a lot recently about the significance of local initiatives and how important they are. Maybe I’m a contrarian, but as the world becomes more global I’d like to see people focus on their communities. So, I was thrilled when I came upon two posts that spoke to local issues. The first, Local Businesses Need to be Findable by Paul and Sarah Edwards had suggestions that in my mind worked as well for nonprofits as businesses. Get a free listing on Google Places. Create a Facebook page for your nonprofit. You can find oodles of posts on how to use Facebook for your nonprofit. Make sure you have a presence on LinkedIn. Invite members of your community to Link to your page. Join relevant groups that touch the issues in which your nonprofit is involved in your community. Start a blog. This will attract the search engines and bring people to your website. Make sure your address is consistent on all your social media sites and your website. Then I was reading another excellent post by Clair Axelrad “Purely Practical SMIT: 4 Keys to Never Lose the Why.” Claire always reminds me why I’m committed to empowering nonprofits to do good. Claire’s March SMIT (Single Most Important Thing I have to tell you) is to never lose sight of the “Why.” It is virtually impossible to connect with people unless you know your purpose. So, instead of bemoaning the fact that you can’t be everywhere at once, bring your passion to your neighborhood or your community. Okay, but how do the two posts mesh? To me, the first speaks to the tools you can use to make sure you have a real presence in your community. Remember the 4 P’s of marketing – Product (service), PLACE, Promotion & Price. Well, Local Businesses Need to be Findable speaks to some of the social media tools you can use to make sure you’re found. Then, add the 5th P – PASSION from Clair’s post and you’re on your way to making a difference in your community. You see, even when your focus is on your community, you must know your purpose and care about it with passion. In a future post I’ll introduce you to a friend who is working on what he calls a Hyper-local initiative. Sound intriguing? You bet! 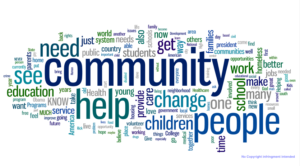 Any thoughts on staying focused on your community? I’d love to hear them.